Entry ways and porches provide protection from inclement weather, but they also welcome visitors to our homes. How do you say welcome to my home at your front door? Nothing is more welcoming than a pretty floral wreath. A grapevine with live flowers and greenery gathered from the yard made a fresh unexpected wreath for our blue front door earlier this spring. Granted, fresh floral arrangements on a front door last only a few days depending upon the outside temperatures, but live flowers and greens make a show-stopping arrangement to greet guests as they arrive for special occasions, like the book club meeting at my house. Every member of my book club commented on the wreath as they came into the house for our monthly meeting. They paused, touched, smelled, and examined the wreath. Several people were surprised the flowers were real, but some knew immediately because they could smell the flowers and herbs. 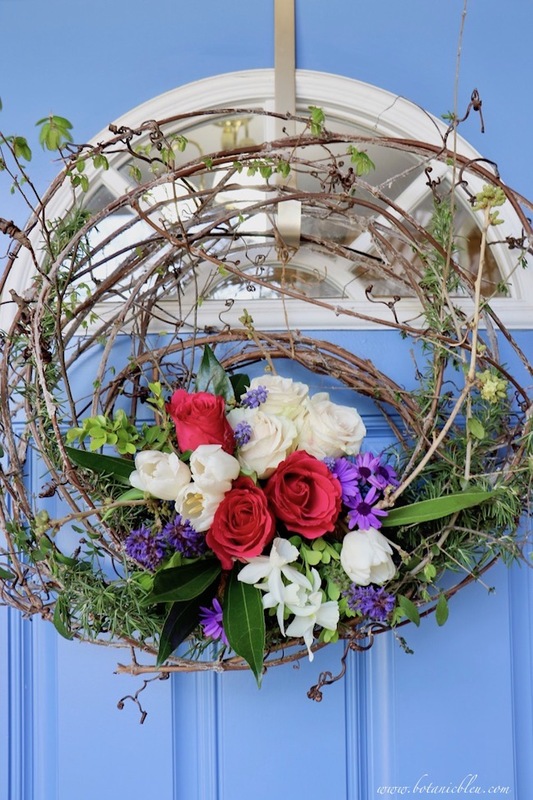 Here's how to make a similar wreath for your front door and special occasion. Begin with grapevines and loosely wind eight to ten free-form circles. Make some of the circles small and close together, but spread apart, near the bottom of the wreath to support a wet oasis block that will hold the flowers. Use florist's tape or twine to bind the grapevine circles together into an open, airy wreath. Hang the grapevine wreath on a hanger that goes over the top of the door to avoid nailing into your front door. Strong adhesive-backed hooks can also be used on some doors. Place tree branches with leaves all around the grapevines, intertwining the branches with the grapevines to secure the tree branches. 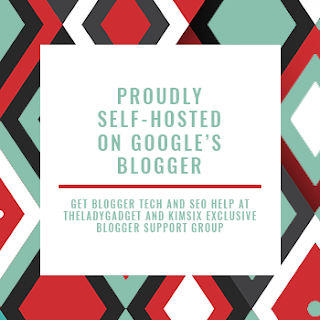 Like fresh flower arrangements from florists, a wet foam oasis is the basis for keeping the flowers watered which makes the arrangement last longer. After soaking a block of foam oasis in water, place the wet oasis into a plastic quart size or gallon size (depends on how big your arrangement will be) bag with the top left open. The oasis should stick out and above the top of the plastic bag. Secure the plastic bag, with the wet oasis, in between some of the small circles of grapevines. 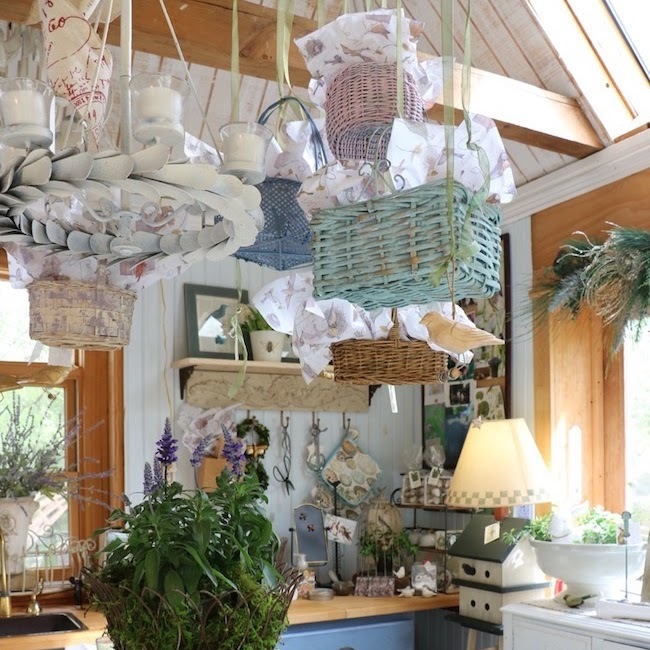 Use florist wire to punch through the plastic bag, and tie the bag to the grapevine. 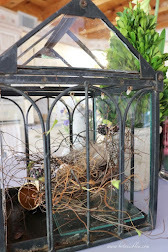 Insert live boxwood sprigs, fresh herb stems, and shrub leaves into the outer edges of the oasis and hanging over the edges of the plastic bag. 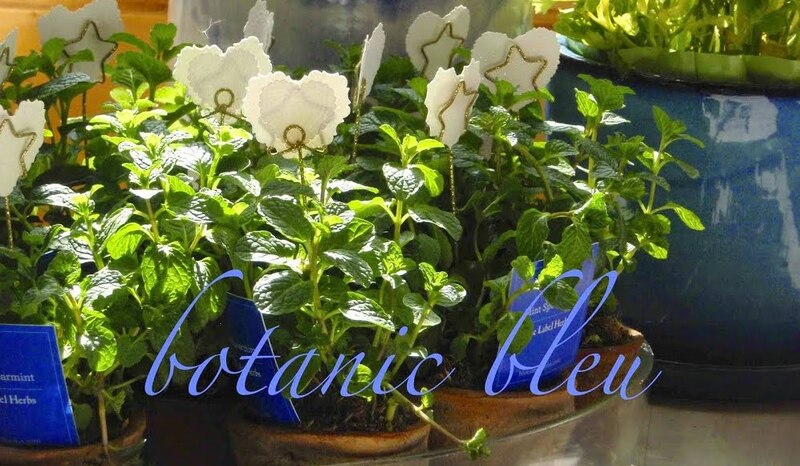 Group two to three of the same kind of flowers together, bind the stems together with a small bit of florist's wire or tape, and insert the flower cluster into the wet foam oasis block. 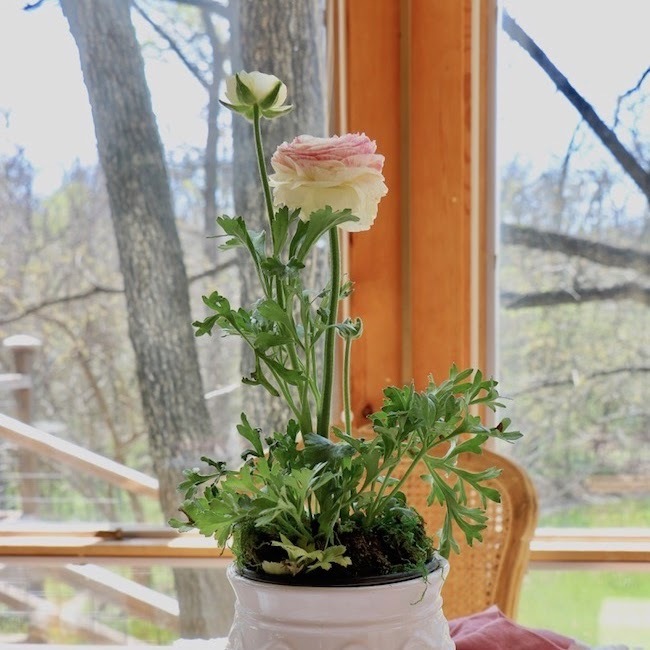 Make four or five clusters of different kinds of flowers. Insert the clusters closely together in the oasis block. Place single stem flowers into the oasis to repeat the flowers in the clusters around the grouping. Look at the close-up photo of the wreath for how the single stems are positioned, peeking out all around the arrangement. Flowers used in the SPRING arrangement shown are a mixture of flowers from the grocery store, bedding plants from a garden center, and flowers growing in the yard or garden. Seasonal fresh flower wreaths can be made throughout the year, not just in the spring, using flowers available at different times of the year. 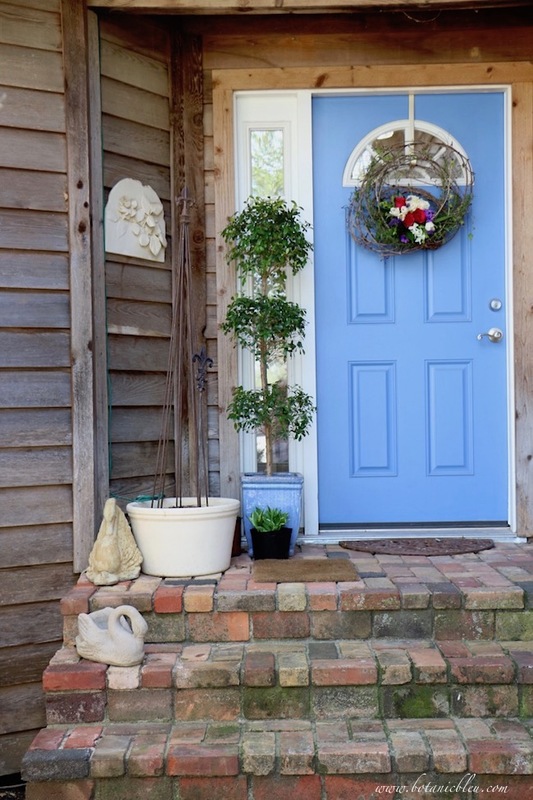 If you want a new perspective of how your front porch looks to visitors, take some photos. Instead of seeing what your mind thinks your porch looks like, you will see details you overlook everyday. Then it is time to take action. 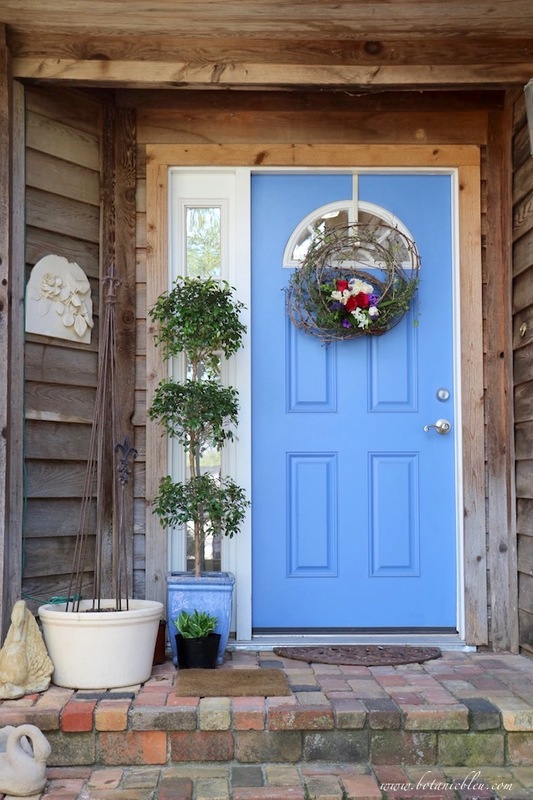 Perhaps your porch needs new paint color for the door, or a new door mat to replace an old worn-out one, or some fresh plants. Seeing photos of my front porch made me realize it is time to refresh the porch. Do you think the cedar trim around the door and side light windows should be painted white to match the side light windows and half-round window in the door? Or should I just power wash all of the porch's cedar siding and door trim and leave them natural? Here is a photo in which I added some white to the trim to get an idea of how the doorway would look painted white. The white overlay is not a perfect fit to the trim, but you should get an idea of how the trim would look painted white. The cedar trim has a rough finish, not a smooth finish. All of the windows and other exterior doors in the house have natural cedar trim to match the house siding. Please give me your opinion, with why, as a comment. Should I paint the door trim white to match the side light or leave the trim natural to match the siding after power washing? 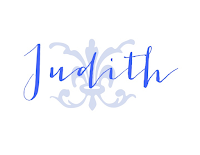 Your door color is so pretty, Judith! I love the living wreath and topiary too. If I were you, I'd start with the power washing just because that's not so hard to do. That way you can see that option first hand and then move on if you want to at that time. Thanks, Stacey. Now if the 100+° would just go away. The early morning hours are a tad cooler, but still hot to work outside. Good advice about waiting until after I power wash the cedar to decide about painting. 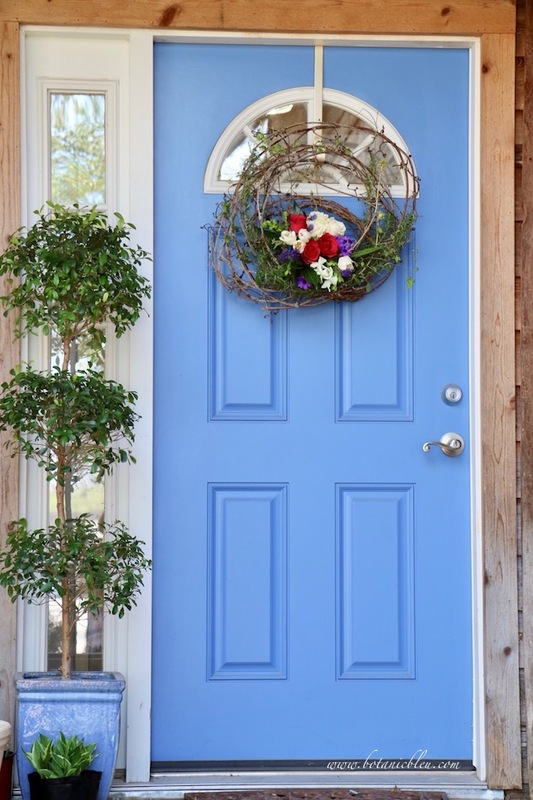 The blue shade of the door is just gorgeous! I would leave the door trim a natural cedar color to maintain a consistent feel around your house. Power washing the cedar will refresh it. 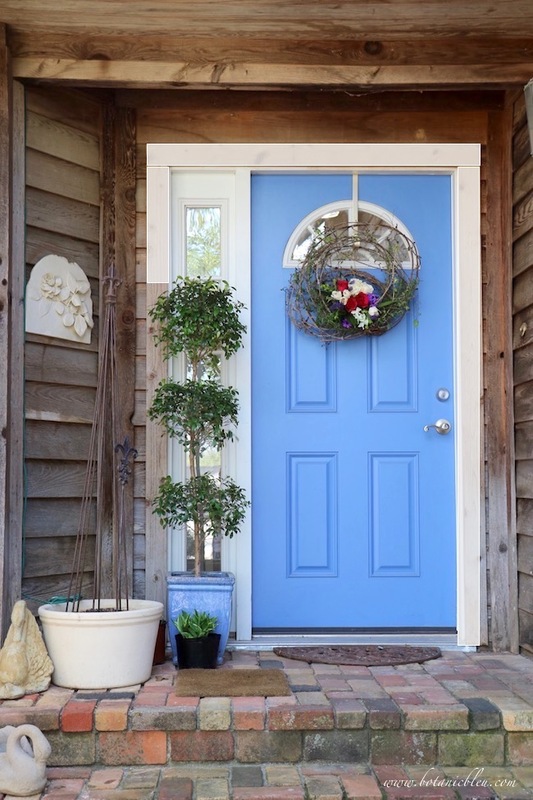 If your desire is to increase the impact of the door, you might want to paint the door jamb, sidelights and half-moon window the same blue as the door. The door would appear larger and more prominent - your eyes would not be stopped by the white but would take it all in at once. 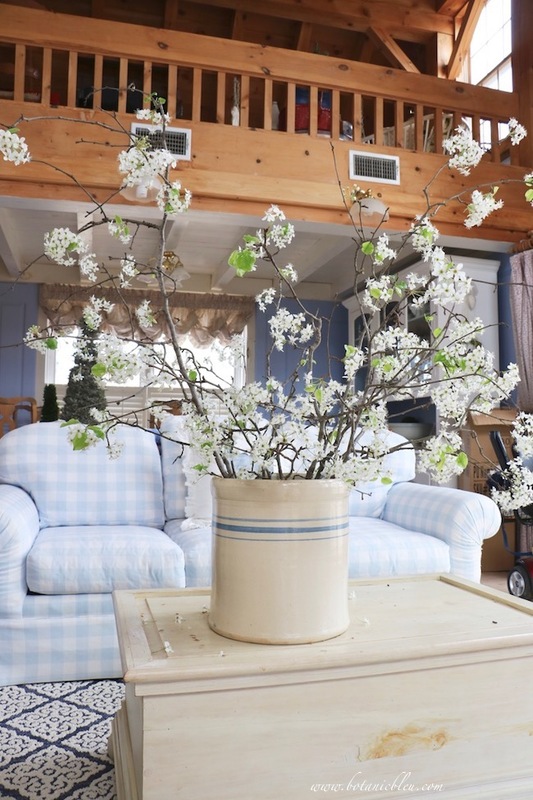 I would also bring the blue pot close to the edge of the porch. I have never thought about painting the half-moon window the same color as the door. Now, I'm mulling that over and thinking I should put a blue overlay on the photo to see how that looks. I love blue doors and your front door is a winner. I wouldn't do anything in this horrible heat! I'm a wimp. I've been making a list of things to do -- sometime in the fall! Stay cool. 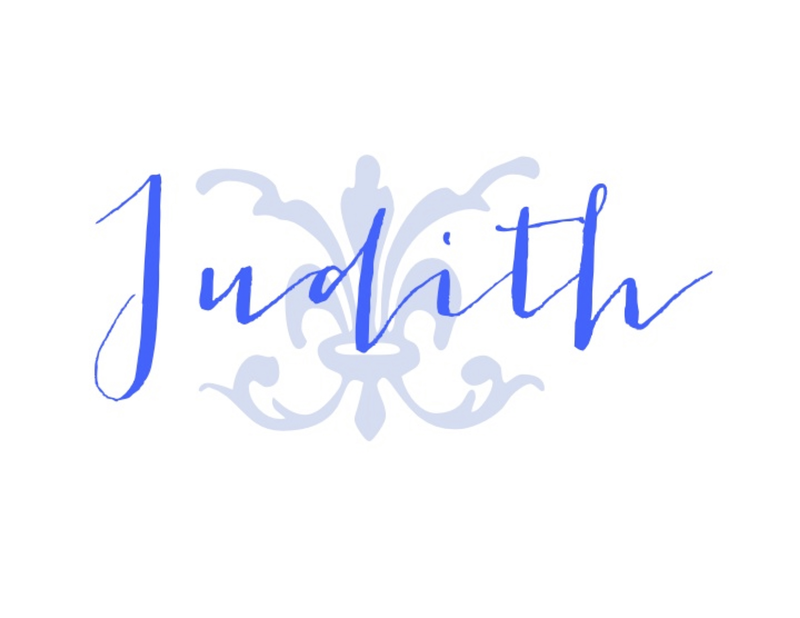 Judith, I love your blue door. Actually, I painted ours about that same shade last summer. I think I would leave the cedar and paint your white half moon window the same as your door. Your shade of blue is lovely with the cedar. I'd paint it the trim to match the sidelight. The door color is lovely and so is that wreath! Love your fresh flower wreath. I will have to try that (when it cools down). How clever to try out the white trim on a photo before really doing it! It looks great, but I think whether to do it also depends on what the other trim on your house looks like. What a darling wreath. I love it. I can see why your book club did too. I would paint the trim to match the sidelight. It gives the door more presence. 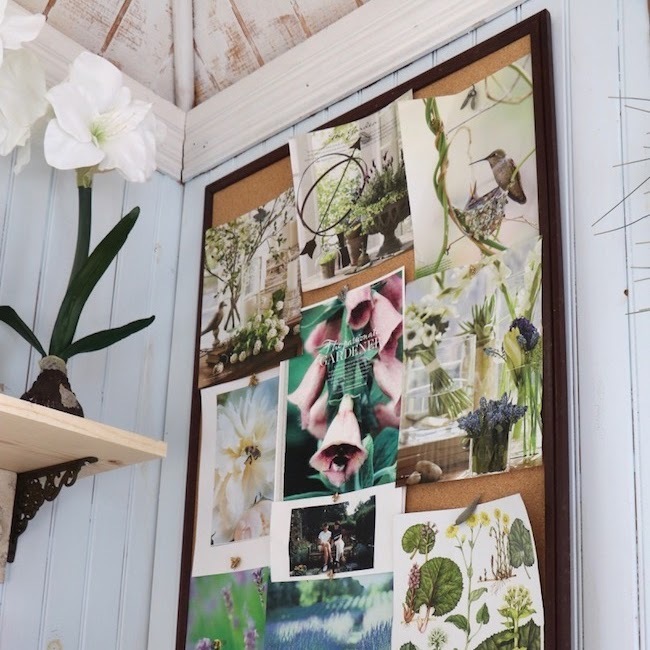 Cute, cute entryway.